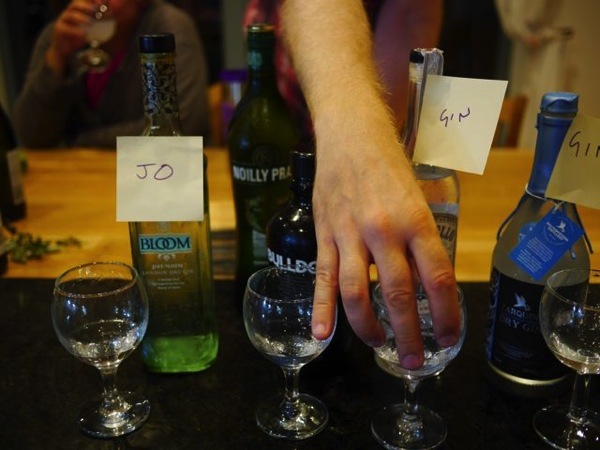 We have gin, we have gin-loving friends — let’s have a gin-off! All of these are described as (London) dry gins, so they’ve been pot distilled with neutral alcohol and have minimal sweetening. There may also be some vapour infusion going on, I don’t know. and finally in a cocktail or G&T. The problem with trying the neat spirit (especially for people who don’t drink vodka) is you get the taste of ethanol and not much else. Bloom ranked high for most people, with the Portobello Road and Tarquin’s taking a close second and the Bulldog bringing up the rear. However it’s worth noting that two of our five tasters placed Bulldog as their second choice, whereas the other three ranked it bottom. I still think it makes a fine sipping gin thanks to mouth feel and smoothness. Of our number one isn’t a regular gin drinker, but likes a martini, and she didn’t like the floral character of Bloom or Tarquin’s. Her favourite was the least flowery Portobello. We later thought the Portobello suffered in the company of the exotic gins. Had we compared it to something a bit more mainstream like Plymouth I reckon it would be a front-runner. It’s a very traditional set of flavours without any attention-grabbing characters, just nicely balanced. Diluting with water didn’t help the Bulldog’s score, sadly. Tarquin’s knocked Bloom off the top spot with a drop of water, and the other two were just behind. I know that drinking gin with water is the way true aficionados do it, but for me it’s too middle of the road — I either want the neat spirit or (more often) a nice G&T. Still, diluting it makes it a lot easier to sort the different flavours. I think the chamomile in the Bloom came out particularly well. After we’d sipped, everyone chose their favourite to go in their drink of choice, and the Bloom bottle ended up with the biggest dent in it. I went for the Portobello in a G&T and I think it was far superior — Bloom and Tarquin’s just gets lost in the tonic if it’s diluted too far. Our martini lover demanded a martini, and was disappointed by the absence of olives — but a bit of lemon zest worked well. I used the Tarquin’s in the proportions on the back of the Noilly Prat bottle, which is a rather dilute 2:1 (I’m not sure Noel Coward would approve). The result was heavy on the citrus and really quite nice. At some point I should try the Bulldog in the same recipe, it may be just the thing. 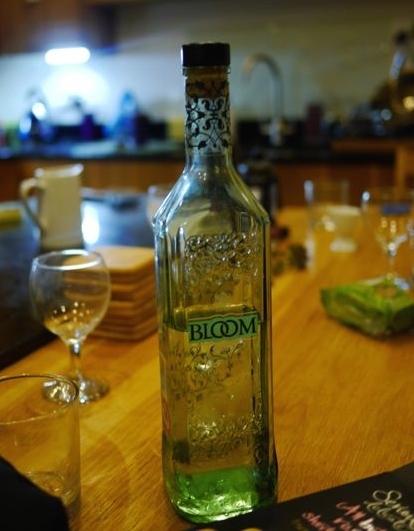 Bloom has a lot of floral character, and the chamomile comes out well when swilling it over the tongue. Very sweet, not much bitterness or acidity. Good for sipping neat, and apparently goes well with strawberries — someone mentioned a strawberry cup at the 9 Worlds gin tasting, and now Bloom makes their own. Bulldog is spicy, and not quite as perfumed as the Bloom or Tarquin’s. The perfume is there, but this gin was the middle child in the round up and suffered by comparison with both the aromatic gins and traditional flavours. It’s a good gin, though, for sipping and may fare well in a martini. 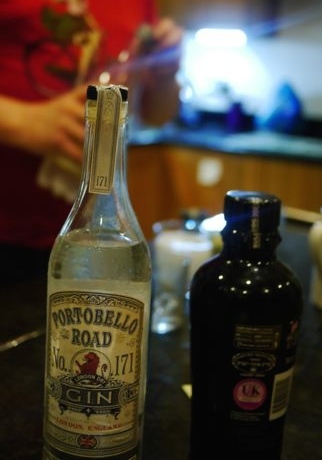 Portobello Road is very traditional, juniper is present but not overwhelming and the other flavours combine superbly. My choice for G&T. 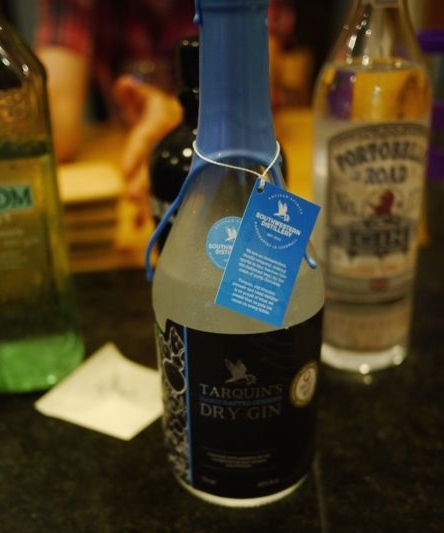 Tarquin’s is very fresh tasting, with flavours like pine needles and oranges and less aggressive bitterness. Fantastic gin, made a lovely citrus-based martini, but like the Bloom may be overwhelmed by tonic. There’s no clear winner, although the Bloom had the biggest dent in it at the end of the night. One thing we noticed was how the design of the bottles conveyed the character of the gin — Bloom is delicate, Bulldog is boisterous and Portobello is traditional. Tarquin’s is the least interesting bottle-wise but there is a good picture of a basking shark on the label. I don’t know if that’s a botanical; I know those sharks aren’t particularly aggressive but I’d be pretty pissed off if someone dumped me in a copper still full of ethanol. Perhaps they stun the shark first. Anyway, enjoy responsibly. Chin chin! What dilution ratio did you use for round 2?